Trent McCauley is a 16-year-old obsessed with creating remix films using scenes from his favorite movies, particularly those starring film icon Scot Colford. The only problem is that Trent needs a huge catalog of film clips--downloaded illegally from the internet--to do this work. When he gets caught illegally downloading from his home network, the government cuts off his family's access to the internet for an entire year as punishment. Horrified that his actions have led to his mother no longer being able to sign online for health benefits, his father unable to work at his telecommuting position anymore, and his sister struggling to complete her homework without internet access, Trent runs away from home. He heads to London where he takes on a new identity as "Cecil B. DeVil, pirate filmmaker", finds community with a gang of creative and resourceful squatters, and falls in love with an anarchist who shows him how the rich and powerful are the ones who really control the government. 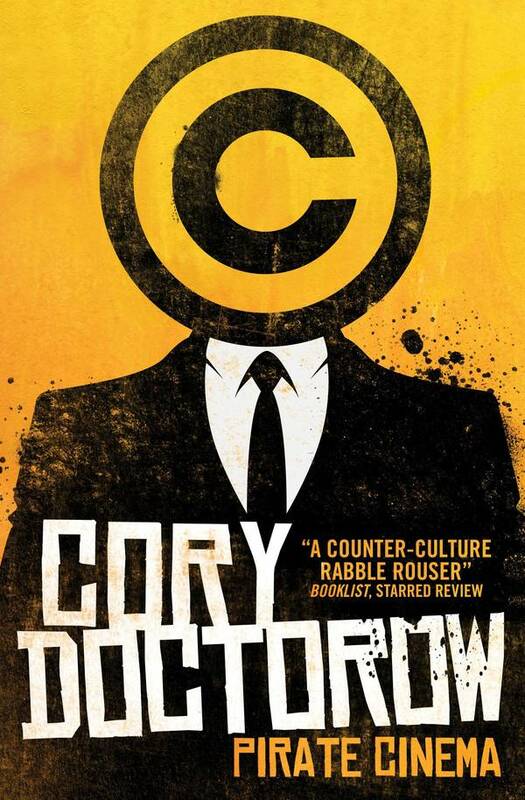 Together, Trent and his ragtag group of artists and political activists set out to dismantle the oppressive copyright laws that have ruined the lives of so many of their fellow citizens. While Pirate Cinema makes many good points about how out of date our laws are for the digital age, how media corporations want to keep them that way to support their antiquated business models, and discusses why planned obsolescence of consumer technologies exists, I ultimately found the plot too far-fetched and the storytelling was really bad. The characters lacked complexity and realistic development, resulting in a revolving cast of caricatures anchored around the rather unremarkable protagonist, Trent. Most of the dialogue came across as overly preachy and entitled--and there was so much monologuing, which I hate! For all their talk of changing the world, taking down "the man", etc., at no point in the book did I actually believe that Trent et al. were ever in any real danger of serious retaliation from the faceless, unnamed corporate entities supposedly threatening to ruin their lives, which made the endless paragraphs of rhetoric all the more unbearably hyperbolic. Sure there were some "close calls" along the way, but they felt superficial and forced, as though the author realized quite late in the book that the protagonist should endure some pseudo-conflict in order to create drama at the end to prove that the stakes were really as high as everyone exclaimed they were all along. One of the things I did appreciate about this young adult novel is how uncharacteristically normal romantic relationships were portrayed. Docotrow spared readers from the typical fairy-tale love story so common of YA literature, instead choosing to write the romance very matter-of-factly into the periphery of the story. I also found it interesting how the characters gave new life to the abandoned and discarded. Living in the disposable culture that we do, I'm always fascinated by the way some people see possibilities where most others see junk. I felt particularly inspired when Trent assembles a custom computer using parts from machines found in the trash because building a computer from scratch is something I've wanted to try. The book also reminded me of just how wasteful our culture is; so much food, clothing, electronics and other still usable items end up in the garbage when they could go to people in need or easily be repaired/repurposed. However, the book's plot tread into ridiculous territory early on when Trent and the gang set up their squat in an abandoned building with free (stolen) internet and electricity, and basically lack for nothing as garbage cans supply all their needs (including gourmet cuisine and medicine). Honestly, Doctorow made the homeless life seem utopic for our teenage high school dropout protagonist, which is absurd. < < SPOILER!!! > > The reader is expected to believe that somehow Trent wins an "insurmountable" battle with an enormous amount of luck, near universal support, and basically no personal sacrifices or hardships. Trent spent the entire book taking whatever he wanted because he felt entitled to do so, having everyone fawn over the brilliance of his "art", living a relatively cushy life off the generous donations of train commuters and a suspicious abundance of free stuff from garbage bins, and in the end literally the worst that happens to him is he has to pay $150 fine and his girlfriend breaks up with him. Oh, and he has to go two weeks without the internet which he whines is the hardest thing he's ever done. Bor-ring. Apparently I was the sole member of my book club with these criticisms though. The rest of book club expressed very positive opinions of Pirate Cinema. I can see their points...to some extent. On the whole, the book is thought-provoking if you don't choke on all the propaganda being shoved down your throat along the way. I've mentioned in previous reviews that I particularly dislike fiction books where the author spends more time proselytizing than storytelling, even if I happen to agree with the arguments presented. My view is that copyright, creative license, fair use and similar ideas/regulations are too complex to really delve into as a novel. An essay or article would have been a more appropriate format to really drill into the concepts instead of beating unsuspecting fiction readers over the head every other page. Honestly, if this novel had not been a book club selection, I would have quit 1/5th of the way through. I'm hopeful that I will find our next book club selection, a collection of short stories entitled The Illustrated Man by Ray Bradbury, a much more enjoyable read than Pirate Cinema. Concurrently, I'll be reading a short memoir called The Misadventures of Awkward Black Girl by the hilarious writer/director/actress Issa Rae.